The United States Congress designated the Emigrant Wilderness (map) in 1975 and it now has a total of 112,723 acres. All of this wilderness is located in California and is managed by the Forest Service. The Emigrant Wilderness is bordered by the Yosemite Wilderness to the south. The Emigrant Wilderness is located on the upper western slope of the central Sierra Nevada Mountain Range and is contiguous with the Yosemite Wilderness to it's south, the Carson-Iceberg Wilderness just to the north, and the Hoover Wilderness to the east. It is an elongated area that trends northeast about 25 miles in length and up to 15 miles in width. Watersheds drain to the Stanislaus and Tuolumne Rivers. 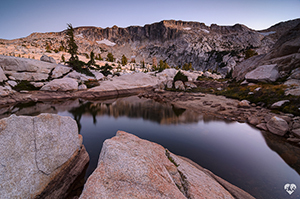 The Emigrant Wilderness is a glaciated landscape of great scenic beauty featuring broad expanses of granite peaks and domes, lava-capped peaks, alpine lakes, mountain streams, and deep canyons. The northeastern third of the Wilderness is dominated by volcanic ridges and peaks; the remaining areas consist of many sparsely vegetated, granitic ridges interspersed with numerous lakes and meadows. Over 200 miles of designated trails lie within the Emigrant Wilderness including a section of the Pacific Crest Trail on the eastern edge of the wilderness. Elevations range from below 5000 feet near Cherry Reservoir to 11,570 feet at Leavitt Peak. Precipitation averages 50 inches annually, 80 percent of it in the form of snow. Snowpacks typically linger into June, sometimes later following very wet winters. Summers are generally dry and mild, but afternoon thundershowers occur periodically and nighttime temperatures could dip below freezing anytime. Various native peoples occupied this area for 10,000 years, spending the summer and early autumn hunting in the high country and trading with groups from the eastern side of the Sierra. The most recent groups were the Me-Wuk of the western slope and Piute of the Great Basin. Following the discovery of gold in 1848, large numbers of miners and settlers came to the Sierra and the native cultures quickly declined. In September-October of 1852, the Clark-Skidmore party became the first emigrant group to travel the West Walker route over Emigrant Pass, continuing through a portion of the present-day Emigrant Wilderness. Several more emigrant parties were enticed by officials from Sonora to use this route in 1853, but it was a very difficult passage with many hardships and was soon abandoned. Relief Valley was so named because of the assistance some emigrants received there from residents of the Sonora area. In 1931, the U.S. Forest Service designated this area for primitive management as the Emigrant Basin Primitive Area. On January 4, 1975, the Emigrant Basin Primitive Area was designated as the Emigrant Wilderness and just over 6,000 acres were added through the California Wilderness Act of 1984. Planning to Visit the Emigrant Wilderness? How to follow the seven standard Leave No Trace principles differs in different parts of the country (desert vs. Rocky Mountains). Click on any of the principles listed below to learn more about how they apply in the Emigrant Wilderness.